Who has not heard of the Common cuckoo, which lays its eggs in nests of other bird species? Some species of the Cuculidae family are known due to their habit of not incubating and caring for their eggs and young by themselves but having other bird species taking over the incubation and rearing. This behaviour is known as brood parasitism. Some cuckoo species thus lay their eggs in other nests and leave it to other bird species to care for the eggs and young. These brood parasites waste no energy that they would use otherwise to rear and feed their young by themselves and can lay more eggs per year compared to species that care for their young. However, when the foster parents recognize the cuckoo egg as not belonging to their own eggs they throw the egg out of the nest or abandon the whole clutch. Less known to most people is the fact that out of 136 cuckoo species only 53 are brood parasites. The Common Cuckoo (Cuculus canorus) occurring in Europe is one of these parasites. It is a highly migratory bird which stays only a few months per year in Central Europe. It parasitizes more than 100 different, insectivore bird species that care for its young. These foster parents are often much smaller in size than the insatiable offspring of the Common Cuckoo. In contrast to the Common Cuckoo, Couas incubate their eggs and rear their young by themselves and are not brood parasites. 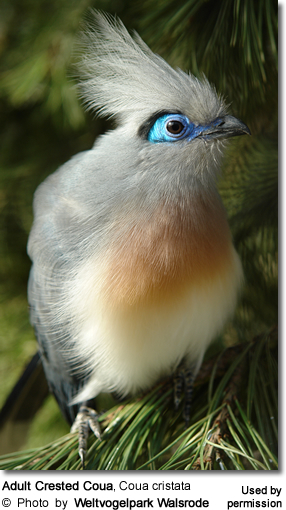 All of the 10 extant Coua species are endemic to Madagascar, where they inhabit different types of forests. The group of birds was named after the silky structure of their feathers which underlines the gentle colors of their plumage. Cuckoos are related to the colorful feathered Turacos – even if this cannot be seen at the first glance. Additionally, Cuckoos show a remarkable characteristic – the first and fourth toe of the foot always points to the back while the second and third toe is pointing to the front. They share this feature with owls and parrots. In cooperation with the Tsimbazaza Zoo on Madagascar, Weltvogelpark Walsrode obtained the first Couas in 1998 – the Crested Couas (Coua cristata). 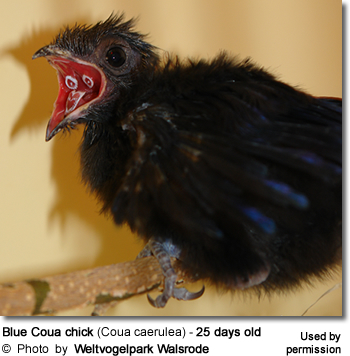 In 2003 another species, the Blue Coua (Coua caerulea) enlarged the bird collection in Walsrode. 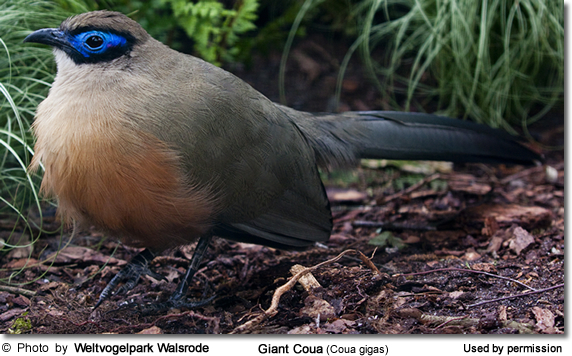 Finally, the largest living species of Couas, the Giant Coua (Coua gigas) was presented to the visitors in 2006. All three species housed at Walsrode have been bred with great success for the first time outside of Madagascar. 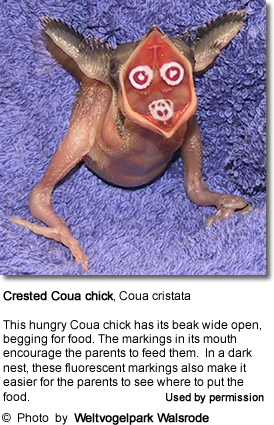 The first breeding success with Couas was already achieved in the year 2000, where young of the Crested Couas were successfully reared. 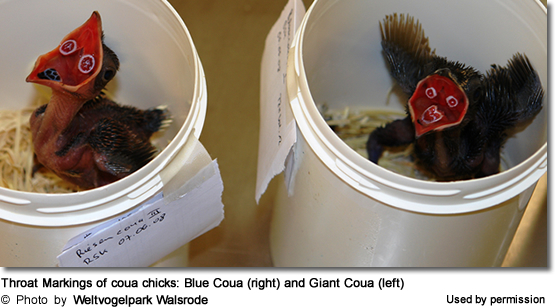 The Giant Coua was bred successfully only one year, the Blue Coua two years after their arrival in Walsrode. Since then there are several offspring every year. Blue Couas live in a habitat with dense vegetation and their lifestyle remained largely a secret until the year 2001 where an expedition of Weltvogelpark Walsrode found nests of this species for the first time. The natural habitat of Madagascar was and still is degraded through logging of large parts of the rainforest. At the moment Couas are not threatened but they are perfect flagship-species for the endangered flora and fauna of Madagascar. The rearing of Couas in captivity is a great challenge with Couas being sensitive and very susceptible for stress. Thus, the pairing of birds has to be done by experienced staff members. Additionally, the enclosure must be heavily planted and equipped with enough branches so that the birds can hide and avoid each other if needed. In general, they are peaceful birds towards other bird species. In 2011, we succeeded again in rearing offspring of Coua species behind the scenes. Four chicks of the Blue Coua hatched and wanted to be fed and cared for the whole day. Blue Couas are very beautiful birds with their magnificent plumage color. Additionally, the eyes are surrounded by a striking, light blue oval of bare skin. Blue Couas are endemic to Madagascar and inhabit the subtropical or tropical moist rainforests in the east and northwest of the island. They are rarely seen on the ground as they are more aborreal, hopping or walking between tree branches. 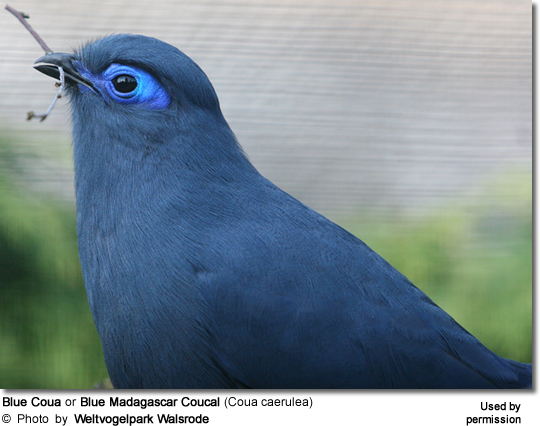 In Europe Blue Couas can only be seen in Weltvogelpark Walsrode and Cologne Zoo, which received birds from Walsrode. In contrast to other species of Couas, Blue Couas only lay one egg per clutch. However, the Giant Coua (Coua gigas) lays 4 eggs, whereas in the nest of the Crested Coua (Coua cristata) you can find two eggs. 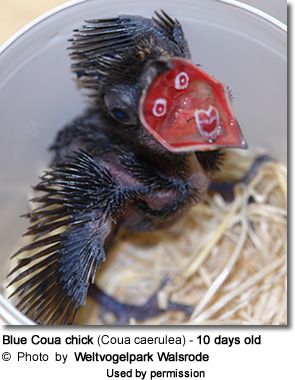 Several times Weltvogelpark Walsrode tried to parent rear Blue Couas, but the chicks did not survive or the embryos died during the incubation period. Thus, all young hatched in Walsrode were hand reared by our experienced staff. The eggs are incubated for about 14 days. Young Couas are very sensitive and susceptible for stress as well. During the first days the chicks are fed up to 8 times a day starting early in the morning until late evening. The food consists of innards of one day old pinky mice, pieces of fruit and drone maggots. The amount and composition of the food of the young Couas is changed and adjusted as they grow until they get the same food as the adult birds – pieces of fruit, meat, fruit pellets and insects. After hatching a chick is placed in a small bowl with a suitable bedding layer as a substitute for the "real" nest. It is especially important that the chicks are not able to spread their legs. Wood wool is used as a nest lining so that the young have a good grip in their nesting bowl. Shortly before fledging at the age of 3 to 4 weeks the chicks are moved to larger boxes. They are still relatively small and wobbly. After 8 to 10 weeks the young are fully grown. A conspicuous characteristic of all Couas is the marking of their throat which differs between the species. In nature, it is used to frighten off enemies. Additionally, it encourages the parents to feed the chicks. With this special marking being different and unique in every individual, a Coua carries its own "identity card".